Another version, the MS-Word 2007.As part of the basic we need to learn and familiarized the most basic and common part of this new version of office automation.indeed, we learned how to use the old once version, the MS-Word 97 and 2003.But actually, in this new version mostly had confusion.Because of the new arrangement of menu toolbars compared to the old once that have a drop/down menu command button. Basically, they have the same application and component of the dialogue box.But rarely, it have additional application, because this version have an enhancement in both application in MS-Office automation.Just like in using the Page Setup command that was usually found in the file menu in old MS-Word.Now in the new version you can use the Page Setup Menu toolbar to setup your margin and paper size together your paper orientation.And publishing your document through your blog and sending it in your personal email account. And one of the most unique and different is auto apply of the selected features through the application template. 1. FILE MENU BUTTON: use as the most standard menu command under the file menu in old version.Once you click, you can print your document, setup restrictions of your document, save and save as, and publishing document in the blog and sent your document in an email, etc. 2. INSERT MENU TOOLBAR: primarily used to insert objects of application.One of the most common is the image or picture,such as: pages,tables,illustrations,links,header and footer,text formatting, and symbols. 3. HOME MENU TOOLBAR: these are the standard and formatting command buttons of the application.Such as clipboard- the cut, copy, paste, and paint command.And also the font formatting command,the paragraph indentions, and the styles of the text. 4. PAGE LAYOUT MENU TOOLBAR: once you prepare your document template, use this menu to apply Themes, Page Setup,Page background, Paragraph Indentions, and text alignment or the arrange buttons. 5. REFERENCES MENU TOOLBAR: these are the table of contents features,footnotes,citation and bibliography,captions,index,and table of authorities. 6. MAILINGS MENU TOOLBAR: in advance use of this new version, use this menu for creating envelops and labels,document mail merge,write and insert fields,preview results, and finish mail merge. 7. REVIEW MENU TOOLBAR: to assure the correctness of our spelling and grammar and other features, this versions have a features of Proofing,comments,tracking service,changes,compare, and protect. 8. 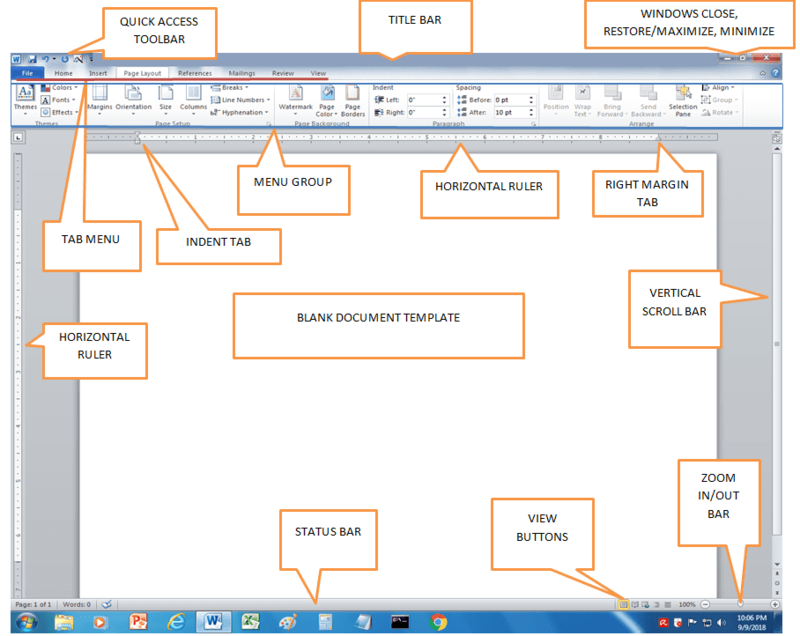 VIEW MENU TOOLBAR: other features included, same as the applications of the view menu toolbar of the MS-WORD 2003. This includes of the Document Views, Show/Hide, ex: Ruler, Document Zoom,Window View, and Macros application. 9. ZOOM IN ZOOM OUT SLIDING BAR: situated at the bottom right side of the document window, this is use to zoom in/zoom out the document.By dragging this using your mouse, rather by selecting a specific number of size of document template. Other parts was tackled in my previous post in User Interface of the MS-Word 2003 parts and function.